I’m going to come right out and say it… I never used to be a big fan of eggnog. Even as a kid, I found it to be cloyingly sweet. Just one sip and I was set till next year, when I would try it again in the hopes of understanding what I was missing. Needless to say, reading the label did not whet my appetite. So instead, I started looking online for recipes, and made my first batch of from-scratch eggnog right then and there. The difference was astounding. It was slightly thinner without the gums and carrageenan, but still plenty rich and decadent. It had an almost woodsy flavor from the fresh nutmeg, and a hint of warmth from the vanilla — flavors that were previously undetectable beneath all the sugar. This homemade version was sweet, but not tooth-achingly so, and I found myself sipping away on glass after glass. The most surprising thing, though, is how easy it was to make. Besides the time it takes to chill down in the fridge, making your own eggnog only takes a few minutes. And the best part is, you can adjust the flavors to taste — if you prefer your ‘nog less sweet, decrease the sugar. Spiked or not spiked? You choose. And if you want to explore some less-traditional flavor options, the possibilities are endless. A few drops of orange extract, a pinch of cardamom, or a dash of pumpkin pie spice would all do nicely to turn this holiday classic into a modern treat. Traditionally, eggnog is made using raw eggs. You would think there’d be a huge spike in salmonella outbreaks around the holidays, but there isn’t, because traditional eggnog is also made with lots and lots of booze, and aged for a few weeks in the fridge. Given enough time with that much alcohol, salmonella doesn’t stand a chance. For those of us who aren’t interested in drowning our eggnog in alcohol, or who want to have the option of a kid-friendly beverage, raw eggs might pose some issues. The most common way to avoid problems is to use pasteurized eggs, which minimize the risk of stray bacteria… but if that doesn’t put your mind at ease, I’ve included instructions for cooking the eggnog, just to be completely safe. Now, it’s no secret that I love making things from scratch. (Can you tell?) And nothing makes me happier than sharing that food with the people I love, especially around the holidays. Sometimes I just have to stop and pinch myself, though, and remind myself how lucky I am to do what I do. Like, being able to make a shopping list the length of my arm, and having reliable access to fresh, healthy food. Whole milk, fresh cream, pasteurized eggs… it’s so easy to take these things for granted. I know Thanksgiving has already passed, and we’re all moving on to our Christmas shopping, but this is when it really starts to hit me just how good I have it. When I start to complain about things like scraping the snow off my car, or sitting in traffic to buy groceries, or having to go to more than one store to find what I need… those are luxuries so many people don’t have. Not having to worry about where my next meal is coming from? Now that’s something to be thankful for. Every year around this time, I try to put this feeling of gratitude to good use and give back in some small way. In the past, I’ve done things like volunteer at a food bank, or donate to hunger-fighting organizations… but this year I wanted to do something more. This year, I’m teaming up with 11 other food bloggers and The American Dairy Association Mideast to put together a Big Holiday Potluck! How does this help, you ask? Well, for every LIKE, COMMENT, and SHARE each of our recipes get on the American Dairy Association’s Facebook page, the ADA will donate $1 to Feeding America. One dollar might not seem like much, but it’s enough to provide nine meals for people in need! And all it takes is the click of a button. Every day, more than 50,000 people in the US struggle with food insecurity… in the land of abundance and plenty, that number is pretty frightening. Sometimes it’s hard to believe that something as small as a dollar, or the click of a mouse, can actually make a difference… but it can. And the more clicks we get, the better! This is where you come in! To help, just head on over to the ADA Mideast facebook page, here, and look for all of the Big Holiday Potluck recipes (including this eggnog). Every like, comment, and share between now and December 13th = one dollar donated to Feeding America. Let’s see… there are twelve food bloggers participating in the potluck, and if you like, comment, and share each recipe once… that’s a total of 324 meals! Now multiply that by the number of people reading this, plus facebook, twitter, and pinterest… carry the one… okay, forget the math, that’s a lot of meals for people in need! Once you’re done liking and sharing on facebook, why not kick back and enjoy a glass of homemade eggnog? Go ahead, you deserve it! I always thought I hated eggnog, until I tried making it from scratch. Now I make this recipe every year for my family and friends (who also thought they hated eggnog, go figure). If you've never had homemade eggnog, I definitely recommend giving this version a try! In a large bowl, or the bowl of your stand mixer, beat the egg yolks until smooth and lightened in color. Add the sugar slowly, while mixing, and continue to beat until pale and fluffy. Set aside. In a saucepan over medium heat, combine the milk, nutmeg, cinnamon, and pinch of salt. Heat until steaming, stirring occasionally. Do not let it boil! Slowly temper the egg with the hot milk mixture. To do this, slowly pour the hot milk mixture into the egg yolks and sugar, while whisking constantly. This will keep the eggs from heating too rapidly and scrambling. Once all of the liquid has been incorporated, return the mixture to the saucepan. Cook over medium-low heat until the mixture begins to thicken slightly, stirring gently but constantly, and scraping the bottom of the pot to prevent scorching. If you have a thermometer, cook until the temperature reaches 160 degrees F. Do not let it boil, or the mixture will curdle! Remove from the heat and stir in the heavy cream, vanilla extract, and liquors (if using -- I typically leave them out, and add them later if I want them). If there are any lumps, pass the eggnog through a fine mesh strainer. Chill in the fridge for at least a couple of hours, or overnight, before serving. Fresh eggnog can be stored for up to a 4-5 days or so, or longer if it has the alcohol added. It should be kept in the fridge at all times. Stir well to mix in any of the nutmeg that may have settled to the bottom before serving, and top with fresh whipped cream and extra nutmeg. Enjoy! *optional: in a very clean bowl, beat the egg whites until they reach soft peaks. Add one TBSP of sugar, and continue to beat until they have just reached stiff peaks. Whisk the egg whites into the chilled eggnog. Note that consuming raw eggs increases the risk of salmonella -- to reduce this risk, I suggest using pasteurized eggs, such as Safest Choice™ Pasteurized Eggs, which are processed in a warm-water bath to kill any bad bacteria. 1. I like my eggnog not too sweet, and find it just perfect with a slightly rounded ½ cup of sugar. If you prefer yours a little sweeter, increase the sugar by ¼ cup, or to taste. 2. If you want to mix up the flavor of your eggnog, try adding a few drops of orange extract, a dash of pumpkin pie spice, or a pinch of freshly ground cardamom... or use whatever flavors sound good to you. 3. Traditionally, eggnog is made using raw eggs. Note that consuming raw eggs increases the risk of salmonella -- to avoid that risk, I've included instructions for cooking the eggnog. Or, you can use pasteurized eggs and skip the cooking all together (just add the cold milk directly to the egg yolks and do not heat the mixture). I like Safest Choice™ Pasteurized Eggs, which are pasteurized in an all-natural warm water bath to eliminate the risk of Salmonella. That means you can enjoy raw, homemade eggnog without the worry! 4. Homemade eggnog should be enjoyed within a few days of making it. If you've included the alcohol, it will last longer depending on the amount added. Eggnog should be stored in a jar or airtight container in the fridge at all times. Recipe adapted (loosely) from the always amazing Alton Brown. UPDATE: I finally remembered to measure a batch! This makes approx. 4.5 cups of eggnog, without the booze added. I typically do a double batch and get between 9-10 cups, which is plenty for sharing with my family and in-laws. Special thanks to the ADA Mideast for teaming up with Feeding America, and sponsoring this Holiday Potluck to help support families in need! Note that I received compensation from Safest Choice™ Eggs for including them in this recipe. All opinions are my own. (I only recommend products I enjoy and use myself — I promise!) You can check out their other eggnog recipes on the Safest Choice™ website (including some great ideas for how to use eggnog in your holiday baking). Cheers! This is a gorgeous eggnog! I like how you do math. I mean, should something so horrible (math) help people in need? Of course it should. I understand completely… I used to cringe at the thought of eggnog. But the homemade stuff changed my mind. Worlds better! Love this Willow! Homemade eggnog all the way! Wow! Okay if all eggnog looked like this I would be into it too. I’m like you…one sip and that’s enough for me :) Gorgeous photos! I love eggnog. I have never made it homemade. I might just give it a try this year!! Willow, I am a recent nog convert too and, like you, have such a deep appreciation for wholesome, from scratch recipes. As far as worrying about the eggs….pasteurized is a good idea, but I better back it up with a hefty dose of rum. Safety first! Heheh — you’re right, better safe than sorry! *Glugs some rum into glass* Cheers! This looks gorgeous! I don’t care for pre packaged eggnog either but pass me a glass of homemade any day with a little rum of course! I found you browsing through foodgawker. I saw your photo on foodgawker, and although I’m an avowed eggnog hater, I had to hop over to the blog because the picture was just too gorgeous! I admit I’ve never made my own ‘nog, and I think you’ve convinced me to give it a try. The super-sweet and artifically-flavored store stuff is vile, but you make a persuasive argument for the homemade version…thanks for the inspiration! I’m looking forward to following your blog from now on! I am not a store bought eggnog fan, it is entirely to sweet and very artificial tasting. I assumed homemade eggnog would be too much trouble, but after seeing your recipe, I think you will be making a convert out of me! Can’t wait to try this Willow! Homemade eggnog for the win! Can’t even think about comparing it to the store bought stuff. I love your idea of adding a little orange to work in a subtle new flavor! That is so cool, Katherine! Thanks! your eggnog looks like how i imagine the perfect eggnog would look. I don’t have any experience with the drink, versus a sip of the storebought here and there, i’m sure, and i don’t remember liking it. It’s unfair, certainly, to judge the storebought against what the homemade would taste like: i wouldn’t do it with other things (like marshmallows) so i should try to make the homemade stuff, just to see. i read an article recently where a food publication tried all the eggnogs, and most were, shall we say, way less than appetizing, according to them. Love that you gave a recipe with a way to cook the eggnog. I may sample raw cookie dough constantly, but for some reason drinking straight up raw eggs kind of grosses me out. That being said, I absolutely love eggnog, so I will give this a try! I’ve come to enjoy the Silk SoyNog…have you every had it? It’s half the calories of regular eggnog and is thinner and not as rich, so I actually prefer it. What an amazing round up/ fundraiser to participate in- you rock Willow! It wasn’t until I was an Adult that I actually tried eggnog- it never appealed to me and was never a family tradition. One Thanksgiving Justin and I drank so much rum and eggnog and were quite tipsy that by the time dinner rolled around (mind you a dinner that I had spent 3 days prepping for and all day cooking) we literally sat across from one another had 2 bites of soup and called dinner off until waaaaay later- we were so full from the eggnog! Needless to say that was the last time I ever drank eggnog- I buy Justin the vegan nog this time of year but I just don’t have the palate for it any longer! Just made a 1/3 recipe last night (because I only had 2 eggs..) and it turned out awesome! 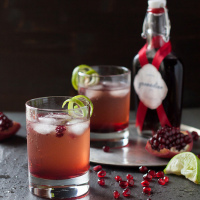 Will definitely be making a big batch (spiked) for NYE and NY’s day festivities. Thanks! How much of a difference in taste does adding the egg whites and 1 TBSP sugar make? Sorry I didn’t respond to this sooner, I’ve been out of town. You can absolutely make the eggnog without the egg whites — I think it adds a little to the texture of the drink (it makes it a little lighter, less thick), but it isn’t a necessary component. Using the egg whites also reduces the sweetness of the drink slightly, but you can always adjust the sweetness to taste. If you find it a little to sweet the first time, just reduce the sugar the next time. Hope that helps! Can the sugar be substituted with a light honey, without much difference? I’m not sure, I haven’t tried it — I imagine the honey would change the flavor quite a bit, but it might work well. I’d love to know what you think if you try it! Today I made this eggnog recipe and It was delicious thanks!! This is what I will be giving my family for Christmas. Happy holidays everyone! Definitely I’ll try this recipe, it’s already on my pinterest to remind me. I have tried it both ways. My personal preference was actually for the cooked version, because it’s slightly thicker and has a creamier texture, but that’s really just a matter of taste. If you’re concerned when it comes to serving it to others, I suggest using pasteurized eggs, which are generally considered safe (the only thing you might want to be careful of is if there are young children or anyone who’s immune system is compromised — but with pasteurized eggs, you shouldn’t have to worry too much). This is the first time trying/making egg nog and it is fabulous! My partner said to me a couple of weeks ago ‘I think we should try some eggnog’ now we live in the UK and egg nog is not exactly a staple over here, hence the fact that we’ve never tried it. So I decided instead of trying to find some I would look for a recipe to try my hand at making it. Now I came across a lot of recipes but there was always something either missing or the process was too faffy. Finally I found this one, it had the right combination of ingredients and didn’t take forever to accomplish. This is really easy to make and definalty customisable, I used 1/2 tsp of nutmeg and 1 whole teaspoon of cinnamon since we both really like the taste of it. The result is something that I think will be on our Christmas to do list every year now. That’s wonderful, Faye, I’m so glad you liked this recipe! Thanks for taking the time to comment, this made me so happy to hear. I used to make eggnog like crazy when I was a teen. I couldn’t find asny recipes that did not involve cooking it, or putting the whipped egg whites into the mix. This is more like what I used to make. Thank you. Thank you, Miriam! I’m glad my recipe was what you were looking for. There are so many ways of making eggnog, I tried to include a few different options here. Happy holidays to you!